Labour Frontbencher calls for Second Referendum and Brexit to be STOPPED! 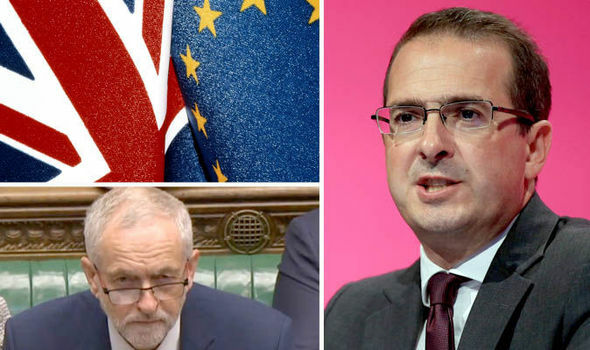 Former senior leadership contender and Shadow Secretary for Northern Ireland Owen Smith has today sensationally broken ranks and called for a second EU referendum in order to stop Brexit. Smith is a well known Blairite and EU lover. He has said: "If we insist on leaving the EU then there is realistically only one way to honour our obligations under the Good Friday agreement and that is to remain members of both the customs union and the single market. I’m pleased my party has taken a big step in this direction by backing continued customs union membership, but we need to go further. Labour needs to do more than just back a soft Brexit or guarantee a soft border in Ireland. Given that it is increasingly obvious that the promises the Brexiters made to the voters – especially, but not only, their pledge of an additional £350m a week for the NHS – are never going to be honoured, we have the right to keep asking if Brexit remains the right choice for the country. And to ask, too, that the country has a vote on whether to accept the terms, and true costs of that choice, once they are clear. That is how Labour can properly serve our democracy and the interests of our people." Calls are being made for Jeremy Corbyn to sack him immediately as there are fears this could be a Blairite plot within the Labour Party and also this is an attack on the millions of Labour Leave voters who are being betrayed. UPDATE- He has just been sacked. Good! Read: "BREAKING NEWS- Terror attacks hit France"